MELU Shampoo is another cult product from Italian hair care brand Davines. 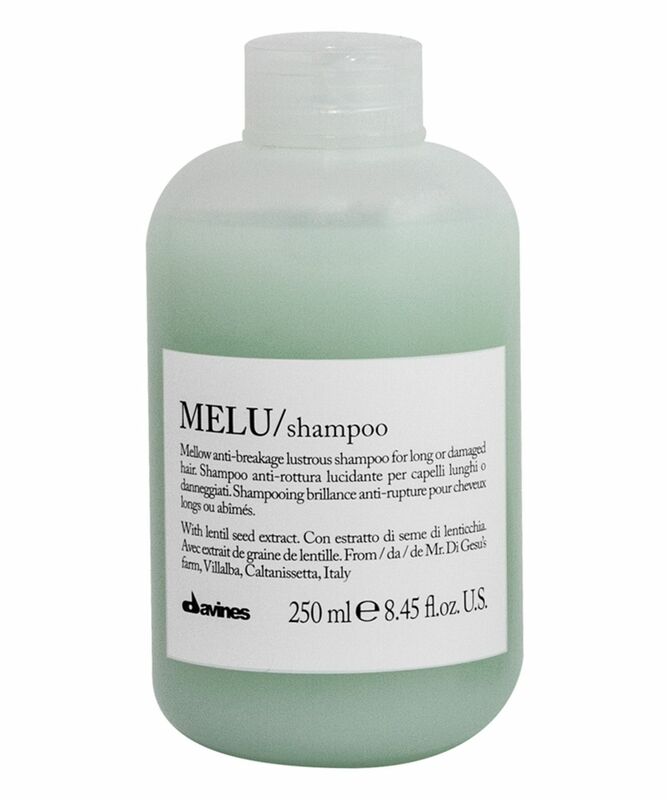 All products in the range are enriched with active ingredients to protect the structure of the hair from stresses like combing, brushing and heat styling so if you're addicted to your straightening irons, MELU is for you. The brand, which came out of the Bollati family's commitment to combining high-grade natural ingredients with first-rate scientific rigour, is beloved by discerning A-Listers and beauty buffs all over the world. Gently massage throughout wet hair. Rinse. Repeat if necessary. Water, sodium laureth sulfate, glycerin, cocamidopropyl betaine,olive oil peg - 7esters, coco - glucoside, glyceryl oleate, disodium laureth sulfosuccinate, sodium olivamphoacetate, panthenol, peg - 12 dimethicine, acrylates/c10 - 30alkyl acrylatecrosspolymer, glycol distearate, guar hydroxypropyltrimonium chloride, dicaprylyl ether, polyquaternium - 44, silicone quaternium - 8, spinacia oleracea (spinach) leaf extract, polyquaternium - 10, laureth - 3, lauryl alcohol, disodium edta, propylene glycol, glyceryl stearate, sodium chloride, sodium hydroxide, benzyl alcohol, sodium benzoate, phenoxyethanol, sodium sulfate, cinnamyl alcohol, benzoic acid, dehydroacetic acid, ci 42090 / blue, ci 19140 / yellow 5, fragrance. I have pretty thick hair but it was damaged by bleach and sun, so my stylist recommended trying this shampoo. I like it, it left my hair pretty soft. But I don't think it was noticeably different enough to justify the price compared to other sulfate free options. The first time I used it I looked like I had just came out of a tumble drier and decided to only use it on days I wasn’t leaving the house. On one of the house days, I gave it another go and I had a completely different result! I loved it, my hair was soft and wavy and amazing, I use this with Davines Monu treatment which is also one of my favourites if not my favourite hair product ever. I can really tell the difference, using this with the conditioner and protection spray. It strengthened my bleached damaged hair. They are now going back to their natural thickness. I have also bleached my hair since using this and its helped my poor hair stay soft. And this stuff smells lush. This is the best shampoo I have ever used. My scalp has never been so happy; no other shampoo has ever calmed down my oily, pimple-prone scalp but this one has done so immediately. Not only that but the shampoo and conditioner combo of this product has definitely strengthened my finer-type hair, which is very long now and usually a nightmare to detangle. Thank you Davines! Best shampoo ever!! I use this alongside the conditioner and its amazing. My hair always feels so silky smooth and straightens perfectly. I have thick bleach damaged hair and this is the only thing that works! I have fine, but a lot, of heavy Asian hair. I'm trying to grow it out after years of abuse, and this shampoo just works so well. Doesn't weigh my hair down, feels really strong, smells amazing. I get compliments all the time (I also use the melu conditioner in tandem). After years of using different products, I’ve finally found the one for me. It’s actually stopped my fine dull hair from falling out I would 100% recommend this to everyone. For very thin hair this gives it structure, smells great and gives a gentle wash for amazing looking glossed hair ! And comes in a super handy bottle which I am definitely going to recycle!! Silky smooth hair ( I do combine with OUAI oils & products) but the shampoo is non-intrusive if you wash your hair more frequently! I love it!